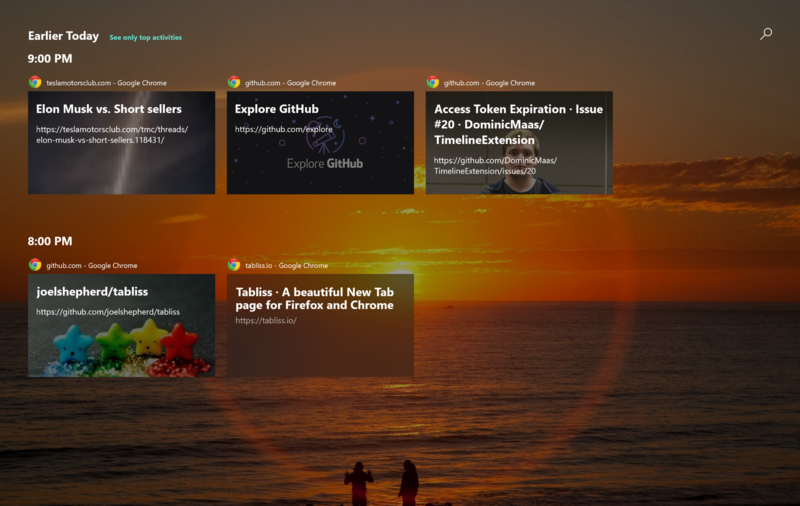 Dominic Maas has developed an extension for Google Chrome and Mozilla Firefox that enables users of these browsers to sync their activity across devices via Windows Timeline. Among browsers, Microsoft Edge is the only one with Timeline support as it requires developers to enable explicit support for Microsoft Graph in their apps. A developer by the name Dominic Maas has successfully managed to create an extension for Google Chrome and Mozilla Firefox that enables browsing history to sync with Windows Timeline. This is of immense benefit to users who do not or cannot use Microsoft Edge as their default browser. The extension syncs the user's activity with the Microsoft Graph API using a Microsoft account. Windows Timeline is part of Project Rome - Microsoft's vision of turning the cloud into a device agnostic OS. Timeline made its debut with the Windows 10 April 2018 update and is an effective way to sync your work and history across devices using a Microsoft account. While Timeline provides a great way to carry work across devices, it does have some limitations in its current iteration. 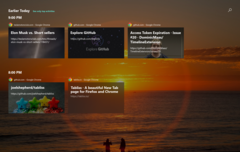 For one, Microsoft Edge is the only browser to support Timeline so users of other browsers have to resort to using extensions such as the one above. Also, not many Win32 apps apart from desktop Office and Adobe CC implement Timeline support so it still has to gain mainstream acceptance. That said, this extension mainly benefits those who wish to see Chrome and Firefox timelines in their Windows 10 PC as these browsers already provide native sync support via their own mobile apps. Also, those using Microsoft Launcher on Android and iOS will also benefit from having Chrome and Firefox activities synced to their Microsoft account. Just be aware that your default browser must be set to either of these browsers to open their respective activities. Otherwise, clicking on a Chrome activity, for example, will still open it in Edge if that is the default on the PC.